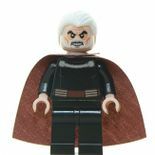 Count Dooku, also referred to as Darth Tyranus, is a minifigure from the Star Wars theme. He is based on the character of the same name from the Star Wars Universe, and has three different variations of him- two from the films, and one for The Clone Wars. To date, Count Dooku has appeared in three different forms - one based on his original appearance from Episode II: Attack of the Clones released in 2002, a variant based on his likeness from The Clone Wars in 2009, and a redesign of his Episode II appearance, to come out in the summer of 2013. 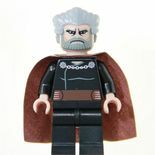 Count Dooku's original version has a standard grey hairpiece, a yellow headpiece with black printing drawn on for his eyes and mouth, and dark grey printing for his eyebrows, beard and wrinkles. His torso piece is primarily black, but has printing on the front to portray the clothes that Dooku was seen wearing in Episode II. This includes brown printing at the top with a silver chain, and a brown belt at the bottom. The torso also has yellow hands, and the leg piece is purely black. This variant came with two accessories- a brown cape, and a red-bladed lightsaber, with a chrome curved hilt, based on Dooku's curved lightsaber. Dooku's second variant, made for The Clone Wars shares some similar pieces with the original version. The leg piece remains the same in every way, as does the lightsaber blade and hilt. The torso printing also bears a likeness to the original, although the silver chain is more prominent, and the belt is larger and a different shade of brown. The minifigure once again comes with a cape, however this time it is coloured red-brown. Dooku's head piece was redesigned to give a more "cartoon feel" to the figure, which was done to most figures with Clone Wars variants. This time, the head piece is flesh-colored, as are the hands. The hairpiece is a light gray piece which shows more of the top of the head piece than a standard hair piece. In 7752 Count Dooku's Solar Sailer, this hair piece is interchangeable with a red-brown colored hood. In 2013, a new version of Count Dooku was released, once again based again upon his appearance in Episode II: Attack of the Clones. This incarnation of Count Dooku strongly resembles Sir Christopher Lee to better depict his film character. Dooku sports Draco Malfoy's hairpiece in white, a black body with a printed clasp for his cape and a brown utility belt. He also has plain black legs, a brown cape and his unique curved lightsaber. 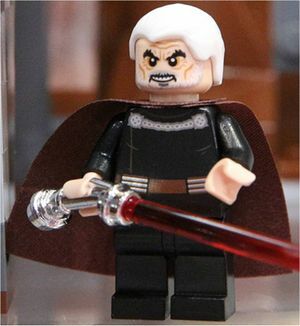 This variant of Dooku features a double sided face; one side shows a neutral expression, while the other one depicts a snarling, angry face. 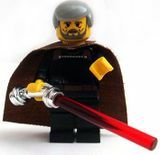 Count Dooku has appeared in all five Lego Star Wars video games to date. He is able to double jump, use Force lightning, and use the Force (including the dark side) to build things. In the first three video games, he is seen in his original variation (with flesh color), whereas in The Clone Wars, he appears as he does in 7752 Count Dooku's Solar Sailer. His first appearance is as the boss in Star Wars Episode II: Attack of the Clones, Chapter Five (in LEGO Star Wars: The Video Game) or Chapter Six (LEGO Star Wars: The Complete Saga):in fact, the chapter name for both is "Count Dooku". When in story mode, the player must fight him as Anakin Skywalker and Obi-Wan Kenobi, then later with Obi-Wan and Yoda. Dooku then re-appears as a boss character in Star Wars Episode III: Revenge of the Sith, Chapter Two: Chancellor in Peril. When the player reaches Palpatine, they must defeat Dooku in a lightsaber duel. For these three games, Count Dooku is identical to the 2002 appearance except with light nougat skin rather than bright yellow. 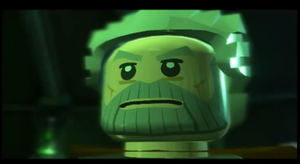 In LEGO Star Wars III: The Clone Wars, he has the same abilities as he does before, but with some extras such as being able to but through some marked walls, and jump up sets of walls by burying his lightsaber in one wall and leaping to the next. In the level, "Castle of Doom", he is a playable character along with a MagnaGuard. 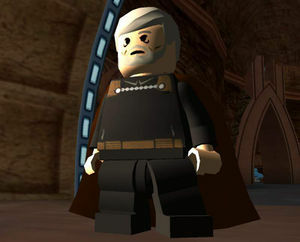 His appearance in this game is identical to his The Clone Wars version except with black eyes with white pupils rather than large cartoon eyes. Dooku was once a Jedi Master, and successfully trained Qui-Gon Jinn, his first Padawan, in the ways of the Force. Dooku later left the Order, being the twentieth Jedi Master in two thousand years to do so. Shortly after this time, Palpatine revealed to Dooku that he was Darth Sidious, a Dark Lord of the Sith, and convinced Dooku to join him. Dooku, or Darth Tyranus as he was now secretly known as, initiated a project to raise cloned soldiers for the Republic without the Jedi knowing, and then began to form an alliance of corporations, which later became known as the Confederacy of Independent Systems, or Separatists. A galaxy-wide war eventually broke out between the CIS and the Republic, with Dooku as the head of the CIS, and his Master the head of the Republic. The first battle began on Geonosis, where Obi-Wan Kenobi, Anakin Skywalker, and Padmé Amidala were captured. A force of 212 Jedi led by Mace Windu, and later the army of Clone troopers he had began, clashed with thousands of Battle Droids in the Geonosian Arena. Dooku attempted to escape the battlefield, but was confronted by Kenobi and Skywalker, and the three dueled with their lightsabers. Dooku defeated both the Jedi Knight and the Apprentice, severing half of the latter's right arm. As he was about to leave, Grand Master Yoda arrived. The two engaged in both Force and lightsaber duels. Dooku chose to retreat during the lightsaber duel, and made his escape in his Solar Sailer. The Clone Wars raged for three years, in which time Count Dooku spent it aboard his flagship or in the homeworld of Serenno, where he would recieve orders from Sidious to prolong the Clone Wars between the Republic and CIS, and would take on numerous apprentices in the Warring period. Dooku would usually pass on Sidious' assignments to General Grievous or Asajj Ventress, unless instructed to take care of the matter himself. Dooku's role in the Clone Wars was mostly to convert planets to the Separatists' cause, deploying the Seperatist Senators on a diplomatic mission under his Master's orders or Dooku's own, or to barter with important figures in the Galaxy to join the Seperatists. With Dooku the esteemed head of the CIS, Palpatine saw this as an opportunity to exploit the Jedi's want for the Count's capture, especially Skywalker's, therefore making Dooku part of a plan the Count wasn't known to be involved in. In the final year of the war, aboard Separatist General Grievous's flagship the Invisible Hand, Dooku once again fought Kenobi and Skywalker, this time in front of his Master, who was his "prisoner" on the ship. Dooku quickly incapacitated Kenobi, however Skywalker, now a Jedi Knight, was able to defeat him, cutting off both his hands in the process. Under the instruction of Palpatine, Anakin killed Dooku by decapitation, continuing Skywalker's path into dehumanization and into Darth Vader's shadow. Sir Christopher Lee, who plays Count Dooku in the Star Wars films, also portrayed Saruman in The Lord of The Rings and The Hobbit movies. The 2013 Count Dooku redesign has the same head as Saruman. While chrome lightsabers were largely phased out over time in the theme, Count Dooku has always been given a chrome hilt even in sets released after they were phased out. The reason behind this is unknown. 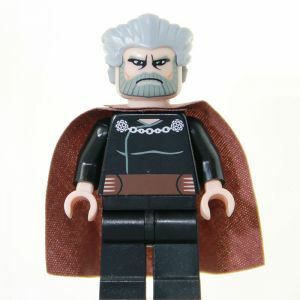 In Revenge of the Brick, Count Dooku has a very similar appearance to his latest film variant but with more detail. In LEGO Star Wars The Clone Wars, Count Dooku has black eyes with white pupils instead of his original more detailed eyes of his Clone Wars version. This page was last edited on 3 August 2016, at 14:27.